Infographics, or the visual representation of data, is increasingly being used by businesses to visually represent complex data to their employees. Especially policies with numerous legal terms or complicated business data lend themselves to using infographics. Infographics can easily be designed by any employee who is creative enough to resourcefully represent data visually and not necessarily only by graphic designers. Numerous online tools are available, but they could also be designed with Powerpoint, Illustrator and Adobe Photoshop. These graphics can be uploaded on the business website and also be distributed to employees via email or even embedded in the business Intranet and should preferably complement the business corporate identity. What kind of data could be visually represented to employees? Business policies could be visually displayed to explain how they affect employees in real business life. Business figures could be made more accessible to employees via infographics by also indicating how these figures impact on the overall business performance. Complicated tasks could be explained visually and even step-by-step so that all employees could better understand them and also how they fit business goals. Important business deadlines could be indicated visually so that no employee could miss them. 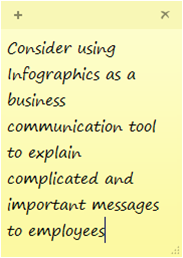 Business events could be highlighted visually so that employees could better understand their importance. There are endless possibilities in the business when it comes to using Infographics and my examples cover only a few. This rather new business communication tool could improve communication in the business in that it facilitates better understanding of both complicated and important messages.